Just want to let you know I received the bike, and I was blown away by it! All of the helpful little tags that were attached to explain certain elements of the bike was a level of service that is beyond exceptional. Truly. It made the unboxing almost like a get-to-know-my-bike class. It was great. Took it out for a small test ride, and it is so much fun to ride! Thank you again to you and Al for all of your help and assistance – you definitely have gained a life customer. Thank you so very much for the wonderful service I received during the purchase and shipping of my new Brompton folding bike! It was so kind of you to not only offer free shipping, but to also include extras such as water bottle and spare bike tire tube. I am having a blast riding my Brompton and letting admirers know the best place to purchase one – Portapedal! Thank you so very much! Enjoy the day! I received the bicycle last night in good order. I was blown away by the care with which it had been packed. I buy a lot of things online but this bicycle is the most well-packaged item I have ever received. Thank you! I rode the bike to work this morning and first impression is very positive. My last bike was full carbon and it made lots of creaky noises when I rode it. This one by contrast is quiet and feels more stable. I hope it will age gracefully. Thank you so much for arranging the sale of this bike. It has been a great experience from start to finish! I meant to leave this review earlier, but I had received my Kiffy from Portapedal 2 weeks ago. My husband had found the one place in the US that sold Kiffy’s and I was so excited to receive it! Buying a Kiffy was a big decision, much less purchasing one out of state because it’s not a common bike in the US, and Portapedal handled the entire process professionally and efficiently. From the moment of purchase, Portapedal responded quickly the next afternoon (we had purchased it late the night before) and informed us the details of where our purchase was in the queue of their orders, because Donna and Al personally tune and check the bikes before meticulously boxing them up for shipping. For this specific purchase, my Kiffy was a demo version, so Donna and Al had to carefully construct a new box that fit the Kiffy like a glove and inserted ample air pockets. They were very prompt with every step of the process, informing us when they would be tuning it, when they would be shipping it, provided us the tracking as soon as the tracking was available. And my Kiffy arrived 3 business days later. Portapedal had shipped my bike via a reputable company that specializes in shipping bikes – Bikeflights.com. The bike box arrived without any dents and was in perfect condition. And the Kiffy, though a demo, rode like brand new. I couldn’t be happier. If you want a specialty bike, I highly recommend purchasing from Portapedal. PortabedalBike wrapped and shipped the bike flawlessly. Al took careful notes on any movement while the bike is in the box and stuffed, wrapped, filled the extra air pockets. The result was a safe arrival in 2 days from AZ to CA. The Tern was tuned and ready to ride after unpacking! Great store, great bike, great owners! I finally have it dialed in to suit me. I’ve got it equipped with the M stem you sold me and I’m using a Wald 867 handlebar. this setup works really well for me. It still folds up into the stem clip, it’s just not as compact due to the backsweep of the handlebar…no worries though because I’ve no need to load it into a plane, just inside my car. Thanks again for a satisfying buying experience. Hi I just wanted to let you both know that I received the bike. It arrived pretty quickly and intact. Packing was great, and everything was well protected. The thoughtful labels tied to various parts of the bike were helpful and informative as well. The bike was in pretty much perfect condition. The only thing I could spot was a couple of little spots on the left pedal, due to the folding pedal. Maybe it was there before packing or caused during transit, but it’s very minor. I could always swap out the that one crank if I ever want to in the future. I decided to wrap parts of the bike in the ISC helicopter tape to protect it at common points where there may be frequent cable rub and what not. The stuff looks like it can be readily removable in the future with minimal residue that can be wiped off with a microfiber cloth and some water. The bike rides great! I’m not 100% sure, but it seems like the little changes they made seems to make it less twitchy than previous year models I’ve ridden. Not sure if it’s the stem, handle bar or what.. or maybe I’m just imagining things. I was on the fence about getting the bike for a long time, due to how pricey it is, but am glad I finally bit the bullet and got it once the new 2017 Black Editions came out with the changes to the handlebar and brake levers. I’ve been getting a lot of joy and fun out of it and expect to continue to enjoy it for years to come. It was nearly dark when we got the Kiffy unpacked and put together, but I still took a few spins around the park — I’m not only impressed that you took so much care in fitting the Kiffy (long distance! ), but am stunned at what a good job it was. (How is that even possible!?!) I may end up altering the seat angle slightly, but that’s all. Really, I’m just so pleased, and just want you both to know how much I appreciate the care you take from start to finish — from great, fast communication to incredible packing and everything in between. Thanks, just a huge thanks! The bike has arrived and I am just finished putting it together. It looks beautiful and great shipping job. Thank you so much for making this happen. I am currently working on a moulton website for Maui and have included your store as a key place to get Moulton in the US. It is a work in progress and I will be adding video of my longer trips on Maui with my new SST. Mahalo again for your work, speed, and quality. I just wanted to let you know that I received my SST on Wednesday. Everything arrived in great shape. I really appreciate the care you take in packaging. I was riding the SST within 45 minutes of its delivery. It rides great! I swapped out the Durango tires on my TSR Alfine 11 with the Marathon Plus tires for rail trail riding. They are exactly what I needed. Thanks for the recommendation. Thank you for the shorter stem for the TSR for my wife. I will probably be purchasing a bike for her a bit later on though, something set up to her specs. I’ll keep an eye on your website. Thanks again for the great customer service. I don’t take it for granted. I just wanted to let you know that I got my bike, set it up, and started riding it. I love it!! Thanks for spending time over telephone to tell me more about the bike and answering questions. I think the 6 speed was the right choice for me, and not as heavy I thought, and am building muscles. My hubby is pretty impressed, and am trying to convince him to get one too. Many folks around me are also interested!! You might get more orders from NM, ha ha…. My Bromton came today (Saturday). Quicker than I expected . I really appreciated the tags with notes all over it; that made setting it up snap. You packing and service were excellent. I’ll be using this bike for many years. We are 4 weeks into our 10 week trip to Europe and our Bromptons are awesome! We have done a few days in Amsterdam, a few in Belgium and are now route finding in the Umbria region of Italy. Everywhere we go the bikes do well and we would be sorely missing them if we had not brought them along. Thanks again for all your great help and advice. We hope your trip to England went well. Just wanted to share some photos of my first outing on the Brompton. The first two shots are downtown in the Civic Space Park under the floating sculpture. In the last photo, note the creative use of the rack (I bought a fitness ball at a yard sale while I was out). Al was right, the rack comes in handy 🙂 I probably need a bag for the front too. Having fun. Thanks for all your encouragement and helpful instructions! I received the bags last Friday, ahead of schedule, and am really pleased with everything. So, I just wanted to thank you, your wife and your daughter for the quick, professional and courteous service. Count me as a huge Portapedal fan! I received the package yesterday and I wanted to thank you for sending the bike with all the instructions attached. I immediately took it out on a ride yesterday from Oakland to Berkeley and it was awesome. You’ve been a great help and thanks for your excellent service. The Brompton is definitely the “Cadillac” of folding bikes in my opinion! 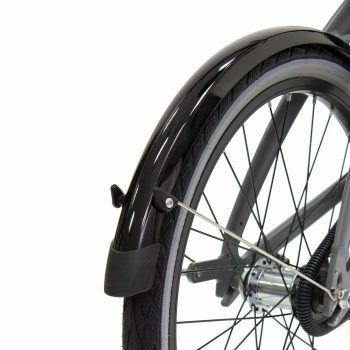 This bike is truly unique, durable, convenient, and most importantly efficient. The fine folks at Portapedal Bike in Tempe, Arizona, USA delivered a high quality product. I live in Hong Kong, so having a bike that delivers in all the above mentioned categories is really important to me. I ordered the Brompton while in Hong Kong and had it sent to my mom’s house in Littleton, Colorado. A few short days later, the bike arrived and my summer vacation started with a nice, new, sleek Brompton Black Edition H6R (12% gearing). Upon opening the box, the bike was impeccably packed. There was absolutely no way this bike could have been damaged during transit, so to say I was happy with the detail of the wrapping would be an understatement. I was certainly impressed with the speed in which Portapedal Bike shipped the bike from their shop after the purchase, as well as the quality of the packing. Portapedal Bike delivered, the Brompton Black Edition impressed, and I’m one happy customer. I don’t own a car in HK, so my bike is sometimes my transportation. I’m excited to get my money’s worth out of this sweet ride for many years to come. 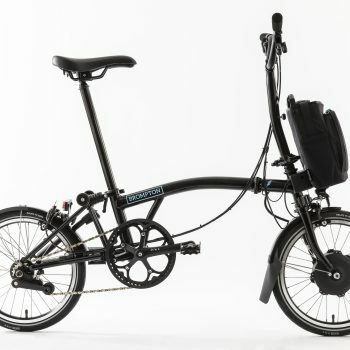 Anyone who is thinking about a folding bike and doesn’t mind spending a few hundred more to get a high quality product, I definitely recommend the Brompton. The ability of the Brompton to fold quickly into compact size AND roll easily and nimbly on the rollers is unparalleled. Last but no least, due to their speed and high quality customer service, I give a double thumbs up to the nice folks at Portapedal Bike! The Brooks Isle of Skye Handlebar Bag I ordered from you arrived today, along with a brief, handwritten note on the invoice, and your business card. I am writing to acknowledge this little touch, as well as the call confirming the order, the follow-up email, and the prompt service. I went to your website and thus know far more about the business you and your husband have than you do about me. Suffice it to say that I know enough about the retail business to know that the two of you myst work very, very hard to achieve any degree of success with just one store, even with internet orders such as mine. I appreciate the extra effort you put forth, and wanted to acknowledge it with this email. My only regret is that my bicycle needs are so limited I will not be able to support your efforts with any additional purchases in the near future. I will, however, save your card and be certain to check back should I ever need anything that you carry. In the meantime, I wish both of you well. Yesterday afternoon, my Raw Lacquer Brompton H6R that you prepared for me, arrived via Fed Ex ground. Last night, I began the process of opening the packaging, and I wanted to share a few thoughts with you about my out of box experience. I run a small business in a professional services industry, and I am very much aware of the energy that it takes to provide outstanding service to customers. It is always the small unnecessary details that matter the most. Yes, the bike is beautiful, and it is a marvel of engineering. I do not need to gush over the quality of the product. I wanted to talk about how thoroughly impressed I am with the attention to detail, and level of service that Portapedal provided in connection with this purchase. You wrapped the bike and shipped it secured in 29 separate pieces of bubble wrap. (Yes I counted this morning.) The level of effort that you put into making sure that the bike would arrive at my house in Florida in the same condition that it left your shop was appreciated. Even though we have never met face to face, and I am 2,100 miles from your store, all of these details and others that I have not mentioned, gave me the experience that I would have had if I would have walked into your shop and been briefed by you and Al personally. Your level of service and attention to detail has made me a raving fan of Portapedal Bike. You have gained another lifetime customer, and you can use me as a reference for future customers. Thanks again for all of your help. You guys are great. Just wanted to send a quick note of thanks. My wife Lori and I have just gotten into bike touring (been an avid cyclist for years but new to touring) and Lori recently ordered 2 Arkel Drylites. They came today. Not only was the order delivered very quickly, but the fact that someone from your company did something as simple as handwriting “Thanks Lori” on the invoice is huge in my book. Companies don’t do that anymore and the fact that you do speaks volumes about your organization’s culture. Thank you! This was our very first order from Portapedal but I know where I will get all of my touring needs from now on. Thanks very much. Though I’m not local to Tempe, I am always happier to support local businesses and esp. bike shops. I bought my first Brompton less than 6 months ago and completely fell in love with it – I can go everywhere with it and my girlfriend has taken to riding my Brompton when we go riding because she doesn’t have a bike of her own (me on my mtn. bike). She loves the Arctic Blue, which they’ve stopped making, so I was super happy to find one still for sale with the gearing we wanted (and need, Seattle is HILLS). A wonderful surprise gift for the new, excited cyclist. I have just got back to Toronto and everything worked out OK. I really like this bike. The design and the convenience complement each other so nicely. I am also very pleased with not only the fact that you pack it up perfectly but you placed all the tags with meticulous instruction how to do. I have never had this perfect remote shopping before. My hat is totally off to you. I signed the document and posted it in Buffalo and the envelope was even stamped! I will make sure I will look after it carefully and will thoroughly enjoy it before winter hits us.